It’s a bird! It’s a plane! No! It’s Tye’s (Satchel: The Life and Times of an American Legend, 2009, etc.) merry, dizzyingly detailed history of America’s first and greatest superhero. Superman made his debut in 1938 in Action Comics #1. The brainchild of Jerry Siegel and illustrator Joe Shuster, two young dreamers from the tough Jewish precinct of Cleveland, Superman was an instant hit and remains an American icon. Tye explores the reasons for Superman’s enduring popularity by examining the lives of the many people who created and re-created the Man of Steel. Siegel and Shuster soon lost artistic control of their superhero, but others maintained the core of his appeal while changing the details of his image and story to fit the times—a chiseled and invincible image in the 1950s, for instance, then a more nuanced and vulnerable image in the ’70s. While he always fought for what was right, what was wrong would change, from fascism to pollution to greedy financiers, and so on. Able to leap from medium to medium in a single bound, Superman was also a marketing goldmine. He starred in a radio show in the ’40s (taking on the Ku Klux Klan in the first episodes) and became a movie star in an earlier serial but more significantly in the later films with Christopher Reeve in the starring role. Superman conquered television in the 1950s, as George Reeves donned the red-and-blue costume, and there has seldom been a period when some sort of Superman TV show has not been on the air. 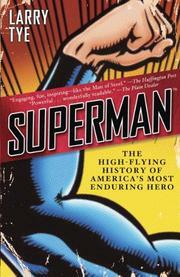 At his best, Tye ably narrates the stories of the many actors, artists and writers who influenced Superman. Occasionally, he offers details only true devotees will care about or be able to follow—e.g., the ever-changing story of what exactly happened on Superman’s home planet of Krypton.